Is there a terror threat in Turkmenistan? That's the big question as the Turkmen government takes actions that appear to support the idea. The authorities seem more obsessed with security than normal lately, and that's saying a lot considering how tight the government's grip over society has been since independence in late 1991. This heightened anxiety comes as Turkmenistan prepares to host an international event later this year but suddenly faces increased extremist activity just across, and possibly even within its borders. 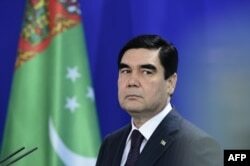 Turkmenistan's government has reason to be worried -- there is fighting in every one of the Afghan provinces it borders. According to local Afghan officials, local military commanders, and villagers, the Taliban controls or exerts influence in dozens of districts -- from Jowzjan Province in the east, through Faryab and Badghis, to Herat Province in the west. And it's not only the Taliban. On June 20, fighters from the Islamic State (IS) extremist group claimed to have captured Darzab district in Jowzjan Province, and government officials and the Taliban each admitted the IS was in Darzab. The IS militants were driven out, attacked by government troops and, from different directions, by the Taliban, but it marked the first time IS had laid claim to a district in northwest Afghanistan. It seems undeniable now that IS has a presence in northwest Afghanistan, though it was already known that Taliban and members of the Islamic Movement of Uzbekistan (IMU) who had sworn allegiance to IS had scattered across the area after being badly defeated in a battle with traditional Taliban forces in Herat Province at the end of 2015. Many expect IS fighters fleeing Iraq and Syria could find their way to Afghanistan, and some may have already done so, judging by their more noticeable presence in northwest Afghanistan in recent months. That brings us back to Turkmenistan, where it appears the government in Ashgabat is worried about IS or an IS-type of attack. Turkmenistan's government has not said anything about this, of course. They never do. Turkmen officials deny there is any problem along the border with Afghanistan, despite Afghan media reports that fighting sometimes happens right along the Turkmen frontier. A source in Turkmenistan's Defense Ministry, speaking under condition of anonymity for fear of reprisals from the government because no officials are authorized to speak with foreign media, told RFE/RL's Turkmen Service, known locally as Azatlyk, that four militants crossed into Turkmenistan from Afghanistan's Herat Province in June. The source said the four were captured in the Kakha district not far from where Afghanistan, Turkmenistan, and Iran meet, and they were headed for Turkmenistan's city of Mary. And he said they were IS militants. A security-services officer who took part in the operation to capture the suspected militants, also speaking under condition of anonymity because he was not authorized to talk, said all four were ethnic Turkmen and citizens of Turkmenistan. The officer, who was familiar with the interrogation, said the four had initially gone to Turkey and from there went to Iraq and Syria to fight. He also said that, when they were caught, the militants were waiting for more of their comrades to cross the border and meet up with them, and the officer added that reconnaissance had shown there were more militants in places along the border in Afghanistan. The area is sparsely inhabited but largely desert so Turkmen security forces are keeping constant watch over wells. The news that a few IS militants might have made their way into Turkmenistan seems shocking, but it may not be surprising to Turkmen authorities. In June, Azatlyk heard from sources inside Turkmenistan's law-enforcement agencies that an undisclosed country (likely Turkey) had apprehended and handed over to Turkmen authorities four Turkmen nationals suspected of being linked to IS. The four were sent to Turkmenistan in May along with information that a possible terrorist attack was being planned against Turkmenistan, according to those sources. At the start of July, Turkmen President Gurbanguly Berdymukhammedov told members of the country's security council: "It is the duty of every military servicemen to guard the legal government structure and carry on an unrelenting battle with any violators of the law." There is a good reason why Turkmenistan would not be a logical choice for a terrorist attack. Turkmenistan is an isolationist country. It is difficult to get information about what is happening there. An attack could happen in Turkmenistan and chances are that nobody outside the country would ever know much about it. But for a brief few days in September that is about to change. Turkmenistan is hosting the Asian Indoor and Martial Arts Games (AIMAG). It's a vanity project of President Berdymukhammedov and not only foreign athletes, but foreign media and spectators are coming. Turkmen authorities want international attention for this event and it is not inconceivable that an extremist group such as IS would consider an attack during AIMAG would gain some needed publicity as the militant group continues to suffer losses in the Middle East. Turkmen authorities have already imposed a series of measures designed to ensure security. There are the regular residency checks to ensure only registered residents of Ashgabat are in the Turkmen capital. No vehicles with license plates from regions outside the Turkmen capital are allowed into Ashgabat. Workers from the regions, many of whom are feverishly working to complete facilities for AIMAG are housed on the outskirts of the city. And following Berdymukhammedov's July speech on protecting the government, new rules require any foreign workers in Turkmenistan to give Turkmen authorities three photographs of themselves, a document showing official permission to work in Turkmenistan from the local administration in the region where they are performing their work, a copy of their rental contract from their residence in Turkmenistan, documents from their employer, and information about any bank accounts they have in Turkmenistan. An official in Turkmenistan's Migration Service, the organization tasked with ensuring that the new measures are carried out, told Azatlyk under condition of anonymity that: "In Turkmenistan, people are worried about possible ties of the population with the Islamic State and they [authorities] ... are obtaining more precise information about the possible contacts of [foreign] workers with organizations potentially linked to IS." This is not the first time terrorism and militants had a Turkmen connection. One of the first videos of foreign militants caught in Syria was in June 2013 and showed four men who claimed they came from Turkmenistan. Syria's Grand Mufti Ahmad Badreddin Hassun claimed there were 360 citizens of Turkmenistan fighting alongside "mercenaries" in his country. And there was the curious incident inside Turkmenistan in 2008 when a gunman killed and wounded several Turkmen police and members of the security forces. But terrorism is still something new to Turkmenistan. Turkmenistan has relied on its UN-recognized status as a neutral nation to keep the country out of conflicts but non-state actors are now appearing in Afghanistan and neutrality might no longer be the shield it once was, something officials in Ashgabat are now realizing.